As Jim Letourneau commented, "Reducing drilling time by 20–40% is an easy sell, and the enhanced oil recovery business has a huge market in the field." In an August 2013 interview titled "Smart Fracking: Jim Letourneau on Enhanced Oil Recovery with Competitive Costs," the Big Picture Speculator editor said, "There are a lot of technological tricks for increasing well productivity with minimal costs: A producer can re-enter wells or stimulate wells or fracture older wells. It can enhance oil recovery with pulsed injection of water or chemicals by utilizing a tool installed in the wells that injects fluids in pulses—pumping like a heart pumps. Think of putting a kink in a garden hose. Pressure builds up and when the kink is released there is a strong pulse of water. This technology is efficient and companies can make money doing enhanced oil recovery with pulsed injection. "One such company is Wavefront Technology Solutions Inc. (WEE:TSX.V), which provides pulsing tools to operations all over the world. It has a couple new business lines with fantastic growth rates. 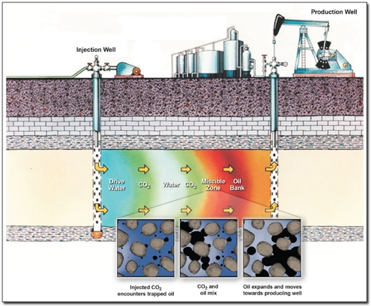 In well stimulation, a chemical (usually acid) is injected into a formation to clean up the area around the well bore so that more oil and gas can flow. By using pulsing, the acid is placed more uniformly and better flow rates are achieved after the stimulation. This part of Wavefront's business is growing very quickly and now accounts for roughly half of the company's revenue." C. K. Cooper & Co. Analyst Darren Odenino was more impressed with CO2 Enhanced recovery, a method wherein CO2 is piped to oil fields, where it is injected via injection wells into the oil reservoir. [See infographic below.] The Department of Energy's Office of Fossil Energy notes that about 114 active commercial CO2 injection projects are underway in the U.S., and together they could produce a collective additional 280,000 barrels of oil per day (280,000 bbl/d). Among the higher-profile projects is Magellan Petroleum Corp.'s (MPET:NYSE) Poplar Field in Roosevelt County, Montana. In his May 2013 interview titled "How to Spot Oil and Gas Takeout Targets," Odenino commented, "The exciting catalyst for Magellan is the opportunity to test its CO2-Enhanced Recovery project in the Poplar field's Charles formation. If that proves successful, Magellan should be headed for a lot of growth." Magellan has already reached several milestones for this pilot project. With funding secured for a two-year trial run and five wells drilled, Magellan is scheduled to begin CO2 injection this very month. Evan Smith, co-portfolio manager of U.S. Global Investors' Global Resources Fund, sees producers moving toward a manufacturing-like process in the coming year with multi-well pad drilling. In an interview earlier this month titled "Producers that Can Pump at $60/bbl Oil," he commented, "The rig count has declined by more than 50% over the last two years, and yet we continue to see a steadily increasing supply of natural gas. It's a testament to the technology that has been developed by the industry to drill faster and more efficiently and to unlock and produce more reserves with less input." "I think in 2014, people in the field will have delineated most of their acreage and are going to turn these things into a pure manufacturing process with pad drilling. Continental Resources Inc. (CLR:NYSE) is testing 16 wells per pad in the Williston Basin in North Dakota. The company will repeat that pattern and drive costs down. We've seen a big shift to multi-well pad drilling in 2013, but I think it's going to become much more standardized in 2014. The efficiencies that we've seen, which have led to more productivity with fewer rigs, will probably remain and perhaps even accelerate in 2014." North American oil and gas industry innovation is a force that is turning the global production profile upside down as companies explore new oil and gas reserves around the world that were thought all but unrecoverable. As Edison Investment Research Analyst Peter Dupont commented in his recent interview, "Has Shale Broken OPEC's Grip?," North American companies with shale tech know-how are poised to unlock reserves around the world, especially in South America. "Some of these companies have first-mover advantage.," says Dupont. "Madalena Energy Inc. (MVN:TSX.V) [is one of] the most obvious examples. . . Madalena has working interests ranging between 35–90% in three blocks in the Neuquén Basin comprising a sizeable 135,000 net acres. Contingent and prospective recoverable resources are estimated by Madalena at 2.9 Bboe, of which 45% are oil and NGLs. There is a mixture of conventional and unconventional plays. Small quantities of oil are presently obtained from the conventional Sierras Blancas formation in the Coiron Amargo Block, where horizontal drilling technology is being applied. Madalena's key focus presently is to secure a joint venture partner for the appraisal and development of the Vaca Muerta and Agrio shale formations. Securing a partner or partners would be a critical catalyst for the stock." Canaccord Genuity Research Director Christopher Brown saw shale tech sweeping the old world, especially in Ukraine. In his November interview, "Four International O&G Juniors for a Globe-Sweeping Shale Revolution," Brown commented, "On the Ukrainian side, Cub Energy Inc. (KUB:TSX.V)has done well at introducing new technologies to the country. Cub has received the approvals to bring in this new technology and apply it. It's going to be a slow process, but as the company continues to unlock value, there's no denying that its region and fiscal terms are very good and provide a lot of incentive to keep on working hard to grow the production base. Turkey hosts a more difficult unconventional basin. The Anatolia Basin is still in its earlier stages, whereas the Ukrainian assets have some proven opportunities. In the Anatolia Basin, you do have some majors that are tentatively playing around the edges, but there has not yet been anything that's really unlocked that basin. But it didn't cost Cub much to enter the basin and the Turkey play provides shareholders with potential future value, which they don't pay for at Cub's current share price. ". . .History has proven Ukraine has access to significant volume. That's why Cub is in this country: It believes it can unlock more value. . .through its ownership in a separate private holding company (Pelicourt Ltd.), management holds a major position in Cub Energy, and recently it decided to put in additional dollars to show confidence in the future of Cub. As of its last statement in October 2013, it owns 39.54% of the shares outstanding. That's provided a decent amount of market support." As the oil and gas sector continues to transform worldwide, keep tuning in for Streetwise interviewsthat shed light on promising oil and gas explorers that are poised to deliver shareholder value.